Below I will outline what I feel are some high-probability set-ups for a handful of swing trades. At the very least, maybe you’ll find it fun or interesting if you’re not up for the risk. In the beginning of the year and for the next several months subsequent, my timing skills became out of whack. This is normal as nobody is right all the time. I rely on my ability to “read the tape.” That’s one of my edges…allegedly. Unfortunately, my “tape reading” ability cycles up and down. But every now and again I can get in a zone where I feel like I’m seeing market moves ahead of time, and consequently, make a series of successful trades in a row. Since the return of volatility to the markets back at the end of May, I have been able to capitalize in one of those zones. That volatility has put my technical analysis skills back in play. Keep in mind that I’m not really using traditional chart reading methods where I look for a “flag” in a “rising bear wedge” to determine an intermediate trend change but the overall bull trend remains intact as long as the “Hindenburg Omen” doesn’t offset the “Golden Cross” which is contingent upon the patterns occurring on 5-minute and 60-minute charts but not a daily or a weekly chart. As I’ve relayed before, that kind of stuff can provide value but pretty much gets nullified by skilled systematic traders and the sheer volume of high-frequency-traders in the markets. However, this volatility does allow for my simple use of technical analysis combined with pure “tape reading” to allow for some wins. And by the way that trade is still open for profit potential on a farther-out timescale. The set-up looked like a mini-Eiffel Tower and I think $105 is still in play. 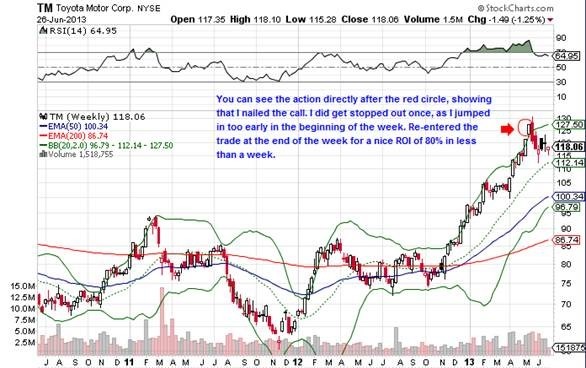 I may re-open the trade as Toyota’s action has been weak in light of the little bounce back in the markets. Now you may be thinking so what. Nice luck, clown. Or even the sun shines on a dog’s rear end, but keep in mind I closed similar trades for profit nailing the turn in the XHB(housing), XLU(utilities), and INTC after it’s jump to $25. Plus, I have other Put option trades open. I also stated in the KSU presentation that a takedown would offer a better entry point for that particular equity when it was priced at $118 at the time I posted the presentation. It’s low since was $102, but I think there’s even more room to correct. But the fun doesn’t end there as there is a tremendous amount of fear still residing in the market. It’s almost palpable and it calls to traders. There has been commentary that the big one is here. 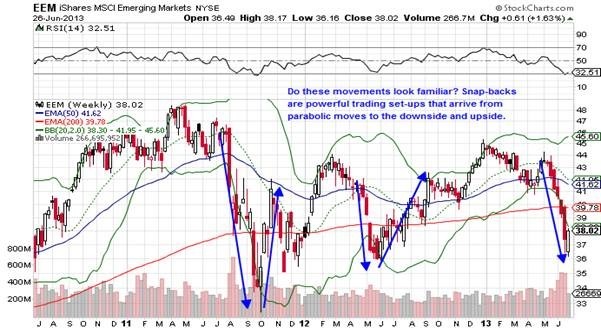 This is the beginning of the huge takedown, like in 2000 or 2007, with enormous sell-offs in bonds and stock markets. I disagree. I see the current situation as a natural correction off the irrational 6-month exuberance that existed from the beginning of the year to June. I can’t really speak for the debt markets, but for the stock markets we could see a bounce back to new highs from here and then a stronger, scarier takedown somewhere in the late-July through mid-September range. It’s more probable that we chop along moving sideways through the Summer with some up and down bouncing and then finish out the year strong as animal spirits recover and taper talk dies down with renewed vigor behind the rhetoric of quantitative easing. Now just because I’m an equities guy doesn’t mean I don’t understand the debt markets. It’s just not my primary field of play for profit. What I do think though is that the BIG, GIANT crash in bonds is not on us yet. That period for bonds will shock the markets as the derivatives and debts of the world come together for the big one. No, what I think the correction in bond prices and spike in yields are doing is conveying the first message that judgment day is coming, so it’s time to start worrying but keep partying for now. As always, who friggin knows? So getting back to the potential money makers I referred to earlier…the first one is on the Aussie dollar. The whole world is short the Aussie dollar. The basic macroeconomic rationale is that the Australian economy is centered solely on commodities and the sale of those commodities to China. 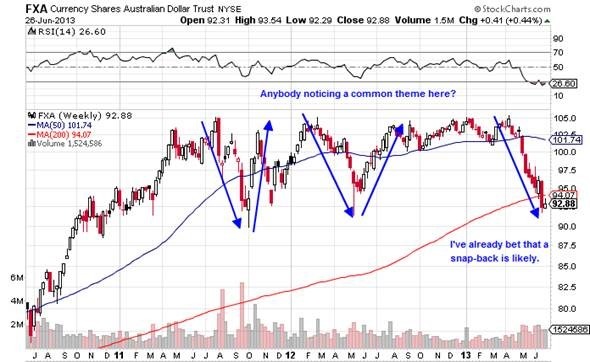 With the whole commodity complex coming down, then the Australian currency is due for a dive. And dived it has due to speculators, bond vigilante’s, or the boogeyman. The fact of the matter is that the Australian economy, although possibly overheating, has not blown up yet nor has their housing market yet, either. The central bank of Australia has been raising rates as opposed to lowering, although I suspect that should change in the near future. And the bottom line is that when the whole world agrees on a trade, you simply have to go contrarian. Even if the macroeconomic rationale is correct, there’s still that little matter of timing. Recall gold and gold shares for proof of that. Anyways, observe the following weekly and daily charts of FXA, which as you should know from previous market notes, is an ETF proxy for the Aussie currency. The hedge funds, family offices, and wealth managers can borrow in a stronger or weaker currencies and short or go long another. That’s a carry trade done on margin. It can blow up spectacularly when done in things like borrowing Yen on margin to buy US safe, dividend paying stocks. It works till it doesn’t and then it can blow up fantastically, which is what we have seen this month. Obviously, I’m not operating on that level. Our trade is the September Calls at a $98 strike on the FXA. These options tend to trade with a little bit wider spreads of around $0.10 despite adequate liquidity, so as of 6/26 each Call was trading between $0.40 and $0.50. Do not put more than 2% of your trading capital at stake in the trade. I use a very wider stop-loss generally on option trades. Sometimes you gotta give a thesis time to marinate and that’s what going far enough out with a wide stop-loss allows. Not to get too remedial or insult your intelligence, but let’s do a quick example of what that looks like. Hypothetically you have $10K to trade and a 50% stop loss. That means you’re willing to risk $200, which means that you’d place $400 into the trade if you’re using the 50% stop loss. The resistance point of $98 is a pre-planned sell price, however feel free to liquidate earlier if you’re satisfied with the profits earned…after accounting for transaction fees of course. Full disclosure, I’ve already put the trade in play. The second trade is in emerging markets. I spend hours every day scouring the web researching various markets and gathering usable intelligence that will allow for a potentially profitable trade set-up. One of the things of I’ve noticed over the last week or so is all the overwhelming negative sentiment on emerging markets. Once again, the whole world is short emerging markets. Literally, all I read are negatives on Brazil, China, India, and the rest of the developing countries and how the US is so strong, while the emerging market investment will destroy your portfolio. As I stated up above, when the whole world is in on a trade then you really do have to go contrarian. 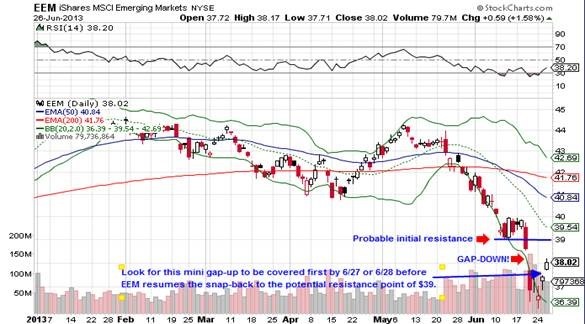 Look at the emerging market ETF, EEM. It has been destroyed in the last 4 weeks and with a serious gap-down just last week. In the daily chart we have two 2 beautiful set-ups that I love to see: 1. confirmation of the beginning of a snap-back, and 2. a gap-down that appears as if it will be covered as part of the snap-back. The weekly shows the snap-back consistency subsequent to a parabolic sell-off. Observe the following charts. I often comment on snap-backs when it comes to trading and that’s because I’m always looking for extremes. It’s one of the easiest things to look for in trading set-ups. Others call it mean reversion, although that’s not always the case as the reversion move may not necessarily move back all the way to the mathematical mean, but you get the point. Regardless, I generalize these set-ups as snap-backs and they’re far and away my favorite set-ups to consistently trade. They can be executed up or down. It doesn’t matter. The only real difference is that downside moves are much more explosive than upside moves, so Put option purchases are a touch more delicate than Call purchases. The trade here is the August Calls at a $39 strike for EEM. Each Call is trading at a fair $0.75 despite the resistance point only being a dollar away. Waiting for the mini-gap will present an even better price point. Liquidate at $39 to be safe or earlier if you’re already satisfied with the profit level. The sentiment against EEM is definitely extreme as the top holdings in the ETF are companies like: 1. OAO Gazprom – Russia’s largest natural gas producer and thus Europe’s largest supplier 2. China Mobil – China’s largest mobile carrier 3. Samsung – Largest company in S. Korea and one of the largest consumer electronics companies in the world 4. America Movil – Mexico’s largest telecommunications company, etc. These aren’t exactly the kinds of companies that are about to become insolvent. Full disclosure, I have not put the play in motion yet as I am waiting to allocate once that mini gap is filled. The third and final trade is a golden oldie. 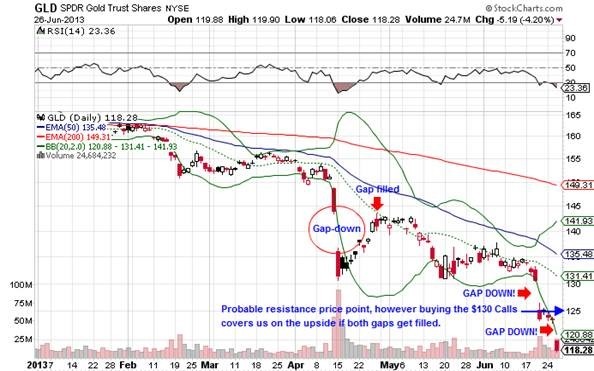 The sell-offs in the GLD on 6/20 and 6/26 also present my two favorite set-ups again. We have gap-downs and we have an extreme shift in the trend. By observing similar action in April, we can see the potential of the snap-back here in June. Understand I’m not calling for a secular trend change here in gold. I’m not saying go all-in gold because the correction is over. I’m just seeing a great set-up that deserves a short-term capital allocation. Observe the first chart, which is a daily chart of GLD. The second chart is of the COMEX paper gold. Using any technical analysis on gold is dangerous due to the gross manipulation, however trading is trading and greed is greed and extremes are extremes. These set-ups look compelling. I had shared with a colleague that I had purchased Calls for September, but was mistaken. The trade is for the August Calls at a $130 strike on GLD. These Calls got killed on 6/26 and could have been purchased for $0.85 as of the close, which is when I purchased my allotment. I suspect the trade will be ready for liquidation at $125, but if paper gold is running kind of hot off of the snap-back then there is the potential for $130, in which case the option should be liquidated. 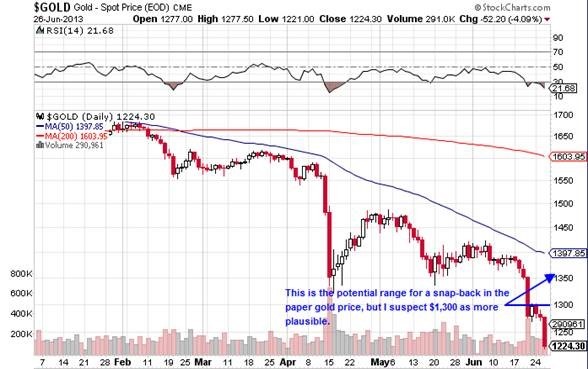 It is probable by that point that the takedown will resume in paper gold as $1,200 has not been hit yet and potentially slightly below $1,200, just to run all the stops set at $1,200 for easy profit. There are some things to keep in mind when considering dipping your toes in. One is that it’s not as hard as it looks. Just be disciplined. Don’t over allocate and get out if the play moves against you. The second thing is that these moves aren’t for waiting on. 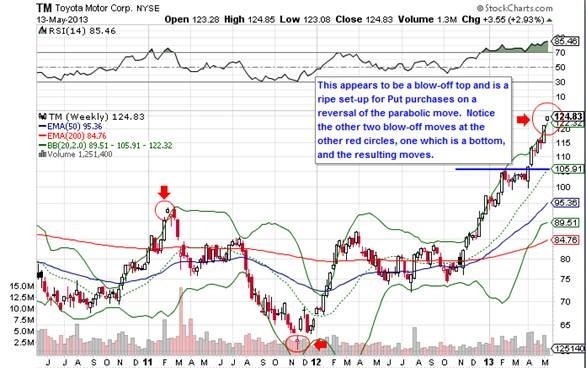 The FXA and GLD options are for immediate purchase, so if you dilly dally and then decide you want to try, you’ll lose. The EEM is only a wait until the mini gap is covered which should happen the next day or two and then I’m going in. The third thing to consider is hedging. It’s not important to try to think outside of your realm of expertise and hedge each of these bets directly. 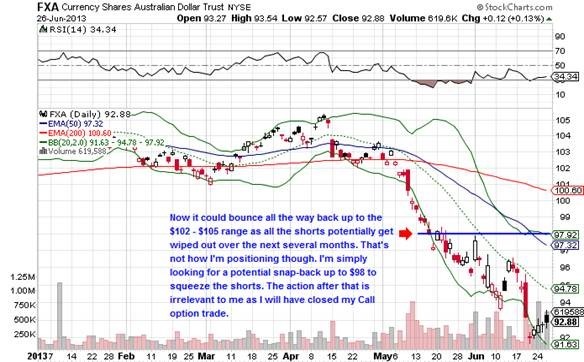 For instance, you don’t need to short the dollar while buying Calls on GLD or buying E-mini Calls on the S&P 500 while you short the Aussie dollar. Hedge funds have expert analysts, with PhD’s, in combination with sophisticated software to determine correlations and anti-correlations between every asset class in the world and then calculate optimal statistical probabilities of a trade. We don’t have those resources. Like I stated in the previous note, think of your 401K’s and safely allocated retirement funds as your hedges to the risk you take on with options trades. It’s that simple. I’m assuming that none of you will try these and I knew that before penned this note. I don’t care what the universities & the mutual fund marketers communicate about asset allocation and thinking of the long term. Markets ain’t efficient and short-term profit opportunities consistently present themselves. I enjoy deep-dive analysis on companies for long-term potential as much as the next value investor. That is also fun for me…and profitable. It’s just that swing trading is more fun and presents profits a lot more quickly, but of course the danger factor is amplified exponentially. At the very least, bookmark the charts from Stockcharts.com and the ticker profiles from Yahoo Finance for the next couple weeks to couple of months to see how these play out…just for laughs. Lastly, remember these are simple option trade set-up’s of the purchase of a Put or Call. You can facilitate more complex option trades around the analysis, but that’s not what I share here. If you have the requisite skill set then you’re covered.